Sir Patrick Stewart addresses the crowd during the People's Vote campaign launch on Brexit at the Electric Ballroom in Camden Town. 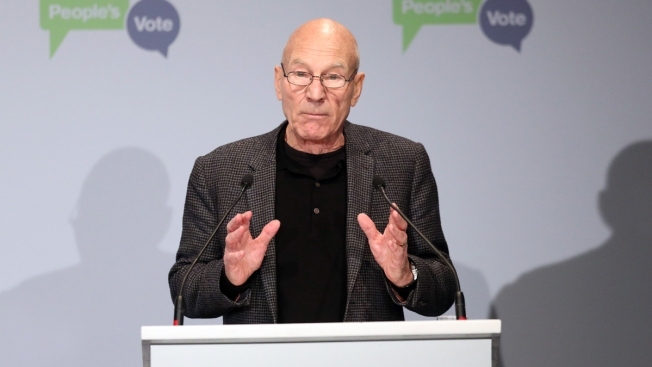 Actor Patrick Stewart drew on his two best-known characters as he helped launch a campaign to give voters the final say on any deal Britain negotiates to leave the European Union. Stewart told the BBC he is supporting the People's Vote because the terms and conditions coming out of the negotiations are very different from those discussed during the 2016 referendum campaign. Stewart said his alter egos, Star Trek's Jean-Luc Picard and the X-Men's Charles Xavier, were "excellent, admirable" individuals concerned about the well-being of all and "they would have voted Remain." Foreign Secretary Boris Johnson countered with a Star Trek allusion of his own, promising that Britain's departure from the EU will allow it "to boldly go again to areas that perhaps we've neglected over the last 45 years."